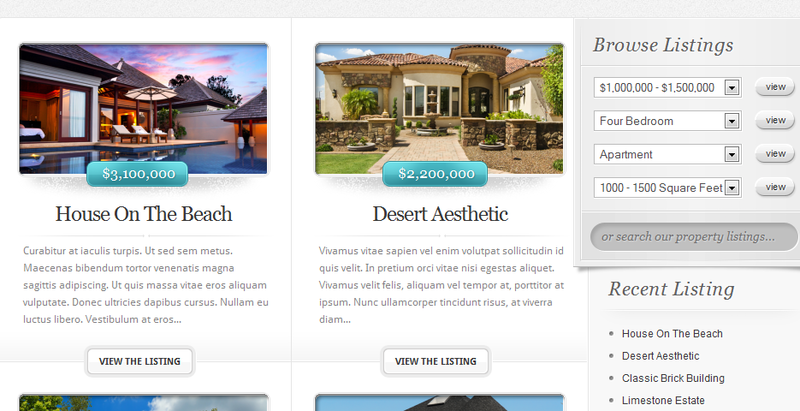 January 16th in Themes for Real Estate Pros, WordPress Themes by Wordpress Jedi . Pursuing a career as a real estate professional can be quite lucrative if you have the drive and passion for buying and selling homes. Whether you are an agent or a broker, you need to have an online presence to showcase properties and connect with potential customers. Bellaina is a responsive, powerful theme powered by Cherry Real State plugin that lets you promote your projects and properties professionally. 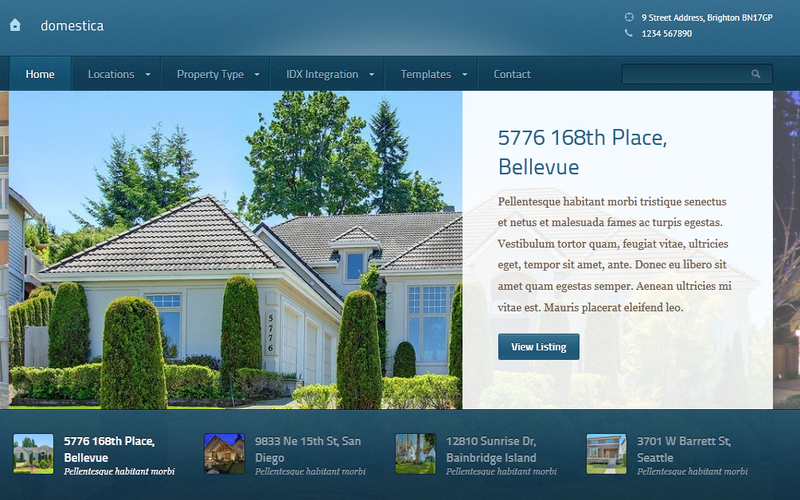 October 17th in Responsive Themes, Themes for Real Estate Pros by Wordpress Jedi . Becoming a successful real estate professional takes time and effort. You can’t simply sit on your hands and hope for more leads. In order to reach more people, you are better off putting together a professional website for your business. 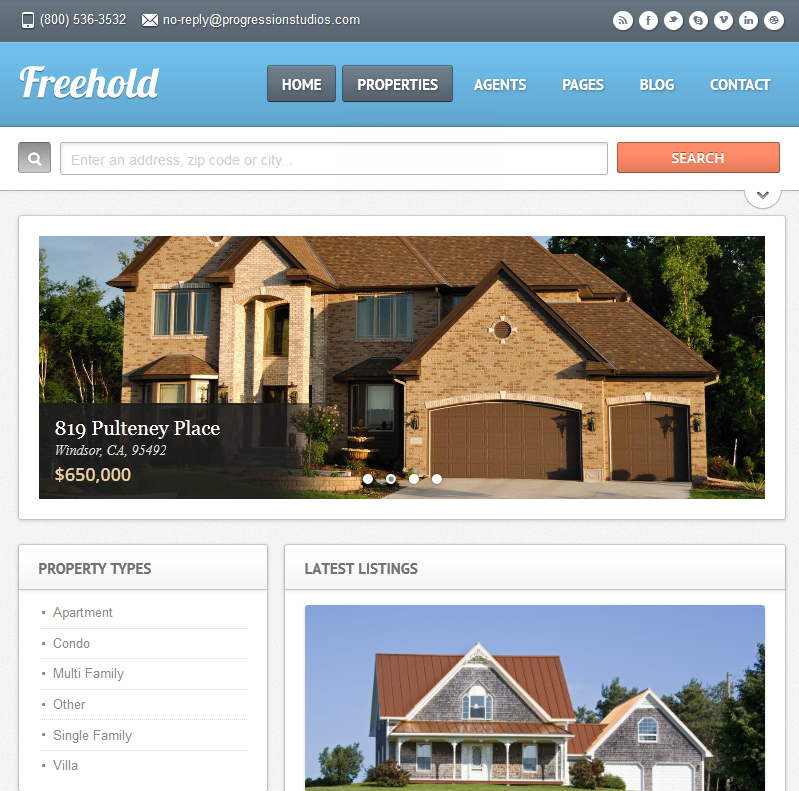 Freehold for WordPress is not your average WordPress theme. It not only looks elegant, it also has a responsive design. January 21st in Themes for Real Estate Pros by Wordpress Jedi . There is no question that the real estate market has suffered a lot in the past few months due to the state of economy. The real estate bubble has been tough for this country to deal with. That does not mean real estate agents can’t make a decent living in this day and age. If you are a real estate agent trying to make it in these tough days, you should take time to give your online website a makeover to gain more leads. Domestica Real Estate Theme is just the theme for that. 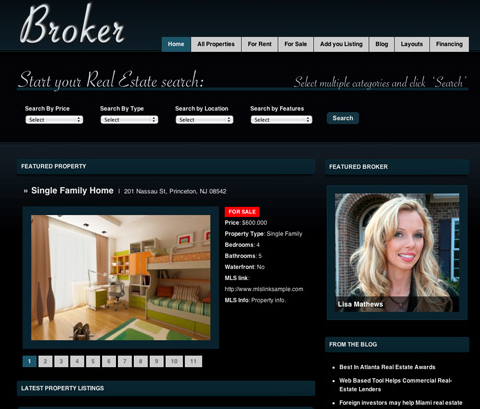 April 9th in Premium Themes, Themes for Real Estate Pros by Wordpress Jedi . The real estate business has been revolutionized with the Internet driving more people to look for homes and agents online. If you are an experienced real estate agent or are just interested in getting started in this business, you are going to need a decent website to back your efforts. Real Agent Theme is a powerful WordPress theme that can be quite handy for small and more established businesses. 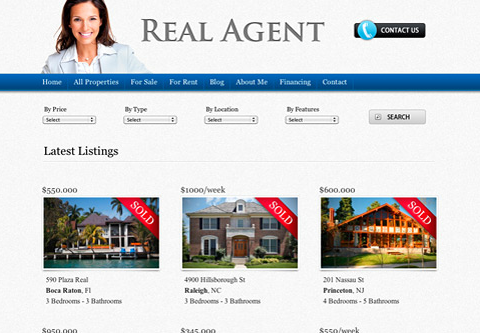 Real Agent has an easy to use interface to help you add your properties and information to your website easily. 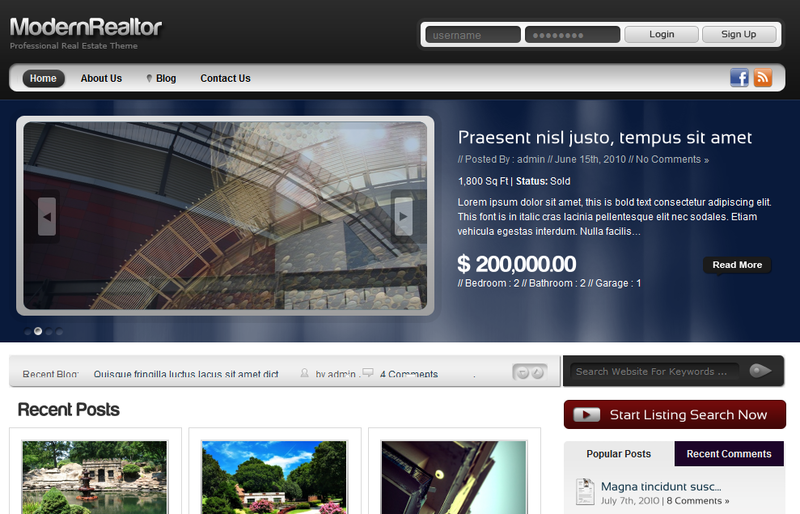 January 31st in Premium Themes, Themes for Real Estate Pros by Wordpress Jedi . 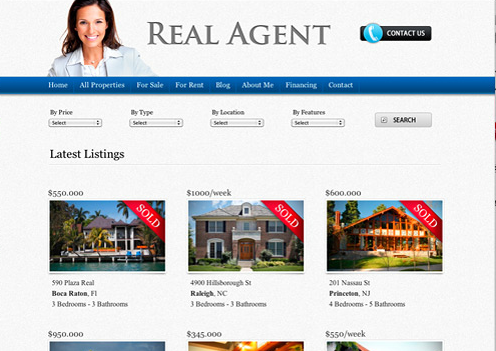 Real agent: a clean, grid-based real estate theme for small real estate businesses. Users can easily customize it (and internationalize it). It supports bulk photo upload. Google Maps is integrated in this theme too. Elegant Estates: it gives you a lot of bang for your buck. It has 5 unique color schemes and is quite image friendly. It supports a side blog for your business too. Modern Realtor: one sleek WordPress theme for realtors. It is powered by jQuery. Supports search by various criteria. Setting up your logo can be done easily in the back-end. November 14th in Premium Themes, Themes for Real Estate Pros by Wordpress Jedi . So you want to start a real estate listing website with WordPress without going bankrupt? There are affordable premium themes that let you do just that. 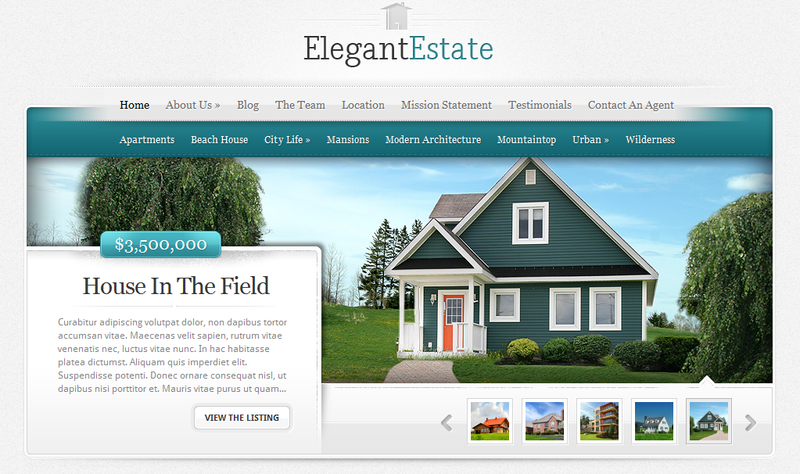 ElegantEstate is one of those themes. It is designed to help aspiring real estate professionals promote their listings and build a professional presence for their business in a speedy fashion. ElegantEstate has everything your visitors would need to go through your listing and find the houses that fit their criteria. They can use the categories that you have defined for your listings to narrow their search. The search box takes the hassle out of your visitors’ search experience.